Commission rate is per side/per contract and excludes clearing, exchange, brokerage & NFA fees. platform or bring your own. At Click Futures, we offer extremely competitive commission rates on all U.S. futures markets. From Gold, Soybeans & Coffee to the emini S&P, Crude Oil and all other U.S. futures & options contracts, you’ll benefit from our aggressive commission rates. Trade online virtually 24/6 though our leading-edge trading platforms or with our 24 hours, phone-in trade desk. 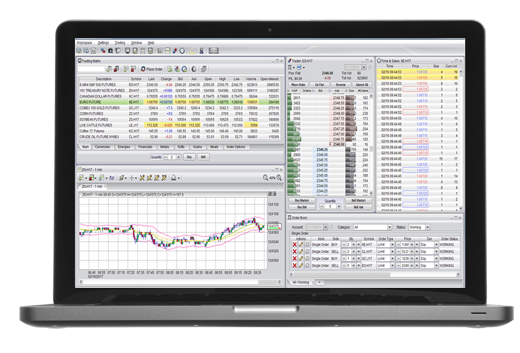 Our Click Futures trading platform is powered by the industry workhorse Firetip trading engine and is designed to be easy to understand and simple to use. BYOP – We also offer a wide range of popular 3rd party futures trading platforms such as Sierra Chart, CQG, PATSystems, CTS, Rithmic, Trading Technologies plus many more. Enjoy exchange minimum margin requirements for all position trading plus industry low day-trading margin requirements. Additional day-trade margin reductions are available for popular commodity futures markets such as the emini S&P 500, Crude Oil and Gold futures contacts through our Advanced Day-Trade Margins program. With our futures trading platform servers co-located at the CME’s (Chicago Mercantile Exchange) data center, we can offer sub-second order execution and quick market order fills. Take advantage of our ultra low latency and direct order routing technologies through our Click Futures trading platforms and trade with confidence.